Planning for the weapon that won the Pacific War began in 1937, when naval engineers began to design an “improved Yorktown” aircraft carrier as the vessel to follow the three big aircraft carriers of that class laid down in 1934 and 1938. With the expiration of the naval limitations treaties, the U.S. Navy was thinking big: Eight of the new Essex-class carriers were authorized under the 1940 program, raised to 11 by the end of the year. Five had been laid down by the time of Pearl Harbor: three at Newport News Shipbuilding and Drydock, two at Bethlehem’s Quincy yard. Lexington recovers a Hellcat during the Battle of the Philippine Sea, June 1944. Of the six potential designs, the Navy chose the last and largest version. The new carrier would displace 27,000 tons, compared to 20,000 for Yorktown. 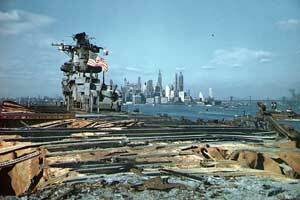 At 875 feet for the original design, she was 66 feet longer than Yorktown. The additional space was considered necessary as aircraft were expected to grow continually larger and especially heavier, requiring more hangar space and more fuel and munitions. Essex as designed had three catapults, with two on the deck like Yorktown plus a third in the hangar deck for launching scout aircraft. As completed, Essex had only the hangar deck catapult while her sister Lexington had only one and the other six of the original order had one on the flight deck and two belowdecks. All eight were rebuilt to the standard of two deck catapults and none on the hangar deck. Hancock and Ticonderoga at Ulithi anchorage, December 1945. Another innovation worked much better, the deck-edge catapult first tried in the small carrier Wasp laid down in 1936. 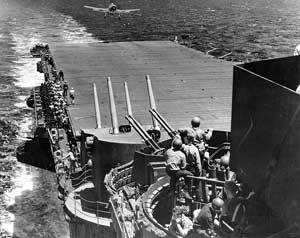 American practice constructed the flight deck with wooden planks, to allow rapid repair during battle, and kept the hangar deck open to prevent build-up of dangerous fumes. American carriers kept their aircraft parked on deck and used the hangar deck as a service area, unlike the practice in most other navies of storing planes in the hangar deck. This allowed the Essex class to carry an enormous air group: 90 airplanes as designed, raised to 108 late in the war through use of outrigger stowage despite the greater size and weight of late-war aircraft. By comparison, the contemporary Japanese Unryu class (the “Japanese Essex”) carried 63 planes, the British Implacable 60, and the German Graf Zeppelin a paltry 43. A kamikaze has just hit Bunker Hill, off Okinawa, May 1945. The later Essex-class ships had enormous range, the greatest of any warship before the advent of nuclear power. The long hull, designed for Pacific conditions, kept pitch to a minimum. Of the 32 ships authorized, 10 of them matched Essex’s dimensions, while the other 22 were 888 feet long. Anti-aircraft armament was massive: eight dual-purpose 5-inch guns in flight deck turrets, four single mounts along the edges of the flight deck, and over 140 20mm and 40mm automatic weapons. In all, 24 Essex-class carriers were completed: Essex herself on the last day of 1942, six ships in 1943, seven in 1944, five in 1945, four in 1946 and one highly-modified sister in 1950. Franklin returns home, April, 1945. 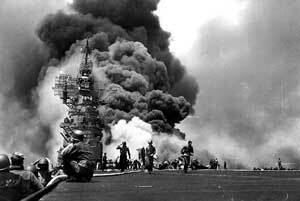 None were lost during the war, although two of them came close: Franklin after several bomb hits in March, 1945 and Bunker Hill to a kamikaze strike in May. Extensive compartmentalization and highly-trained damage control crews allowed both ships to return home under their own power, despite damage far more extensive than that which sank other large carriers like Hornet early in the war or the Japanese Taiho or British Ark Royal. 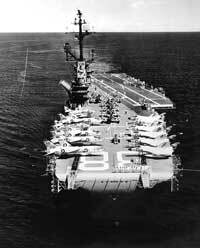 The carriers remained the backbone of the fleet throughout most of the Cold War. In the 1950s the older ships were re-built with angled flight decks and closed in “hurricane” bows. This allowed them to operate the jet aircraft of the 1950s and early 1960s, but they could not handle the big F-4 Phantom II jet fighter-bomber and most surviving carriers were re-assigned to anti-submarine duty. Others became helicopter assault ships or aircraft transports. Many of them operated off the coast of Vietnam and Korea, while their air groups flew strikes against land targets. The newest Essex-class ships, those which formed the core of the fleet in the early 1950s while their older sisters were re-built, did not survive as long. By the early 1960s the new super-carriers had entered the fleet, reducing the need for modernized older ships. Thus the newest of the class were the first to be retired. Shangri-La shows off her angled flight deck, 1960. 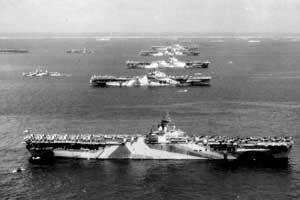 Four of the carriers (Yorktown, Intrepid, Hornet and Lexington) still exist as museum ships. The rest went to the breakers, the last them in the late 1980s and early 1990s. Don’t wait to put South Pacific on your game table! Join the Gold Club and find out how to get it before anyone else!